// Between the lines //: Not giving up! I'm back! - which means I'm not giving up! - but you sort of knew I wouldn't, didn't you!? I need to thank all of you for the support, the nice comments (is this really about me and my blog? ), the e-mails, ... I read them all several times - got all emotional. This more than compensated last week's anger and bad feelings. So, thank you, thank you, THANK YOU to ALL of you!! What a strange thing it is, this (blogging) crafting community - even though most us have never met in person there are strong ties. That's a wonderful feeling. And isn't that's what it's all about? So, what did I do? I sent a friendly and polite letter to the editor, asking to add credits to the article, like many of you suggested. I haven't had a response yet and I'm not sure I ever will. We'll see and I'll keep you posted. But now, I just want to move on, because there are so many things I still want to share here with you. 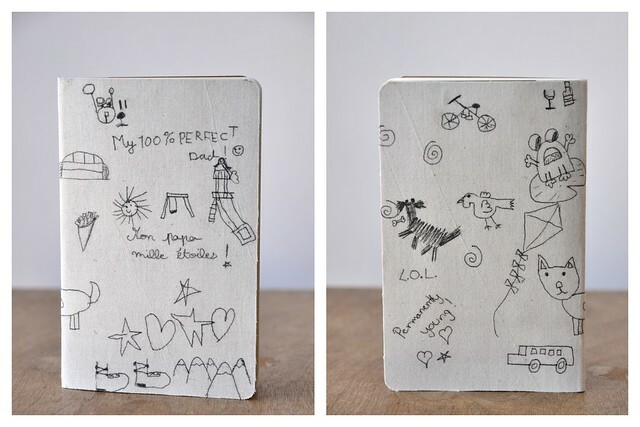 Like this cutest moleskine notebook ever, the girls made for daddy's birthday last week. Isn't it lovely? The three of us were actually in a pretty bad mood that day - the girls had been fighting over things all day and I had been grumpy all day. And you know what? - that little notebook saved the day. By the time the girls were finished drawing we were all happy and cheerful again and couldn't wait for daddy to get home. And guess what?! Among all the presents he got he liked the little notebook best!! I used the same method as for the other fabric covered notebooks, but before ironing the fabric onto the cover I let the girls draw on the fabric with a fine black liner (we used a regular one as I didn't have any fabric markers). Once they were done, I peeled off the Vliesofix's backing, positioned it onto the notebook and ironed it on. With small scissors I trimmed the edges and we had one very, very cute notebook.